I know I said this last week, but WOW! Another great turnout this week. Thank you to all of you for playing along with us. You are the reason that we do this every week and we appreciate your support. Well, it was another tough week to choose a winner and I know the design team had as much trouble as I did choosing their favorites. Don't forget to join us again tomorrow and play along with Nance's great theme challenge. I loved Anni's bold graphic design. The repeition of circles and the added texture from the paper and the stars really made this card stand out. I also loved that Anni chose to round the edges opposite the focal circle. 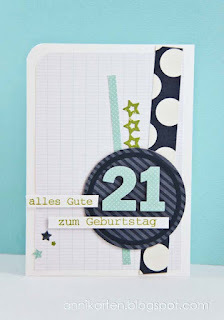 What a fabulous 21st card. Beautifully composed and fabulously executed. Anni, congratulations on being my HEADLINER this week. Now, let's see what caught the eye of our fabulous design team for our CUT ABOVES. 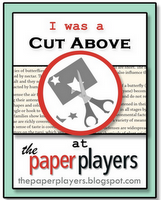 All the CUT ABOVES can wear proudly display the badge below on their blogs. 1. LeAnne's Choice - Angie! Clean & simple is really speaking to me lately, and Angie's cute, bold birthday card is a perfect combo of colors and images! Congrats! 2. Anne Marie's Choice: Pauline always creates such fun cards! Love the playful design and the happy color combo. Congrats! 3. Dawn's Choice: Love the colour combo! Red, Yellow and Blue are a fave of mine! Jumped right out at me. Fabulous CAS card! 5. Amy's choice: Paula's masculine card has so many great details to highlight the main image. Fabulous card! 6. 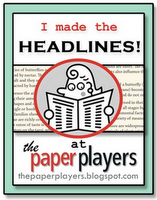 Helen's Choice: I couldn't resist this fun creation from Lyndal. It included an awesome technique on the bubble panel. Congrats! 7. Jen's Choice: Carrie's monochromatic card is so beautiful! I love her embossed framed panel. 8. Heidi's creative use of circles & punches is a genius take on the challenge! Love the colors, shading & black base. Way to go Heidi! Big congrats to Anni and the other winners! Thank you so much for chosing my card as the Headliner! Congratulations to the other winner! Oh, how fun!! So happy that you got a kick out of my Lego card and that all of the extra sponging was worth it. ;) So many great cards to choose from and thanks to the DT for all the inspiration! You girls are THE BEST!